First Response Restoration gets Respectful Workplace Training — Praxis Performance Group Inc. Since we rolled out our Respectful Workplace Certification last year, we’ve had the pleasure of working with a variety of businesses, set-ups, and industries. We’re really enjoying the insight we get into the ways different organisations operate and view respect within their workplace. Some businesses come to us as a response to something that’s taken place at their office, some come as a mandate from a head office that respectful workplace training is required and some register for our training as a proactive measure, a way to educate their team, before there is an issue or to squash any disrespect before it affects morale or operations. 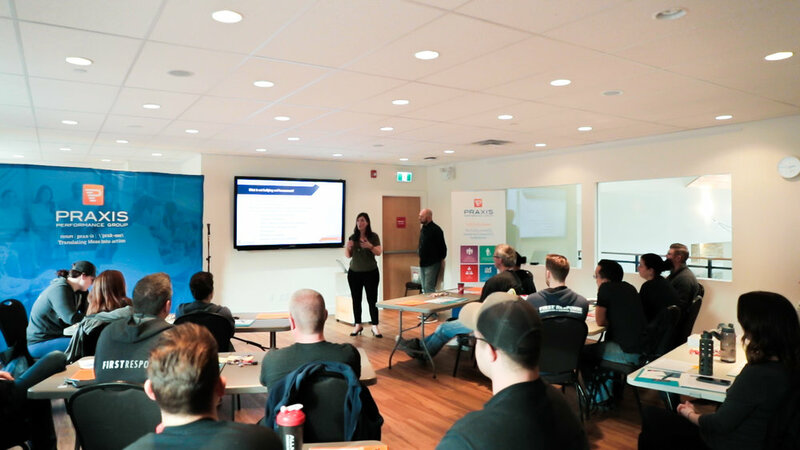 In January we ran a workshop with Gibsons-based restoration company, First Response. Marek Ahlsten and his team have been providing expert fire, flood and emergency services to the Sunshine Coast since 1999. Since that time their staff has grown and the team now has over 25 employees. Christina Stewart President, Client Engagement and Drew Stewart, President, Operations at Praxis Group met the First Response team to share our presentation, engage in interesting discussions and share insight around respect, bullying and leadership. The Praxis Performance Group Respectful Workplace Certification Process begins with Respectful Leadership, and engages every level of an organization in the acts of learning, professional development and personal growth. We know that people want to work for and with organizations that demonstrate respect and that everyone has the right to be treated with dignity and respect. But often employees don’t know what to say or do when faced with improper or disrespectful behaviour. We know to really make change, education and awareness are key. Christina and Drew shared that 40% of Canadians have experienced one or more acts of workplace bullying and/or harassment at least once a week for the last six months. Bullying is also not conducive to a productive business. Bullied employees spend between 60% and 80% of their time at work navigating the situation. Research shows they spend time defending themselves and networking for support, thinking about the situation, being demotivated and stressed, in addition to taking sick leave due to stress-related illnesses. The discussion with First Response was open and honest. Employees shared experiences they’ve had throughout their careers where a comment or situation has made them uncomfortable. The group discussed how to practice empathy and mitigate bullying as well as the role of a bystander. At Praxis Performance Group we are passionate about our community and helping organizations build respectful workplaces. First Response Restoration inspired us with their team focus and open-minded approach to their professional relationships. We love seeing local businesses at the forefront of building respectful workplaces.